Here at the Brookes Inclusion Lab, we bring you weekly suggestions on how to make classrooms and communities more inclusive and welcoming for learners with disabilities. Sometimes we share ideas for supporting parents, peers, and teachers, too. But there’s one very important group of people that deserves more attention on this blog, and in inclusion literature in general: siblings of students with disabilities. Siblings are critical, lifelong sources of support for people with disabilities–they’re usually in the lives of their brothers and sisters much longer than anyone else. They also share many of the same complex needs, emotions, and concerns as their parents, all while managing the challenges and changes of growing up. Siblings deserve close attention and sensitive support from the adults in their lives, and today’s post gives you 12 ways to help, reassure, and involve brothers and sisters. 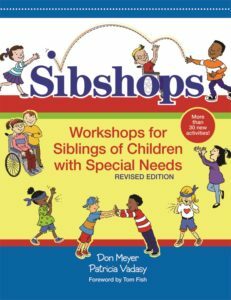 Excerpted and adapted from the book Sibshops: Workshops for Siblings of Children with Special Needs, by Don Meyer & Patricia Vadasy, these suggestions grew from a discussion on SibNet, an online group for adult siblings of people with disabilities. Whether you’re an educator or a parent, these recommendations from real-life brothers and sisters will help you understand and meet the needs of siblings. There are lots of blog posts and book chapters devoted to the wide range of emotions that come with parenting a child with a disability. Siblings also experience an array of complicated emotions, which they may be reluctant to discuss with a parent or teacher. It’s important to let them know that their feelings–even the negative ones–are normal and okay to talk about with you. Acknowledge their concerns when they share them with you and offer reassurance when possible. Set and support high expectations–but watch that siblings don’t take it too far. Families and educators should set appropriately high expectations for children with and without disabilities. At home, parents can help siblings by encouraging independence in children with disabilities–for example, they should learn to do chores and shoulder the same responsibilities as their brothers and sisters whenever possible. Teachers can extend this philosophy in the classroom by presuming the competence of all learners and embedding life skills instruction into their curricula at naturally occurring times. Having similar expectations for children with and without disabilities will not only foster independence for all kids, it can also lessen the resentment siblings may feel when there are “two different sets of rules” in place for them and their brothers or sisters. Setting high expectations for all children is a good thing. But keep in mind that brothers and sisters may react to their sibling’s disability by setting unrealistically high expectations for themselves. Keep an eye out for siblings who may be putting undue social and academic pressure on themselves, talk to them about their goals, and assure them that they don’t have to excel at everything to have your unconditional support. Expect and allow for typical sibling conflict. It might be tough to watch brothers and sisters engage in teasing, name-calling, and arguing when one of them has a disability. You might be tempted to break up the fight and encourage the sibling without a disability to compromise. But most sibling conflict is just a normal–even beneficial–part of growing up and developing social skills. As Meyer & Vadasy point out, “a child with Down syndrome who grows up with siblings with whom he sometimes fights will likely be better prepared to face life in the community as an adult than a child with Down syndrome who grows up as an only child.” So when conflict comes up, let siblings work through it. Brothers and sisters of children with disabilities shouldn’t always have to put their feelings aside–they deserve to have times when they get angry, misbehave, and fight with their siblings just like other kids. In some families, brothers and sisters live with a sibling who has extreme behavior challenges. This might cause stress and fear in some siblings, while others may try to assume responsibilities for their brothers and sisters that aren’t appropriate for their age level. Ensure that children with and without disabilities are safe above all else, and that no child is in a vulnerable situation. The personal safety of siblings should always be given as much importance as the support and education of their brother or sister. Give siblings opportunities to connect with peers. Parents have many options for connecting with other families raising children with disabilities, from online message boards to local support groups. Siblings need the same opportunities to talk with other brothers and sisters who’ve “been there.” Connect siblings with a support program–and if there’s not a group close by, consider starting one. (The Sibshops guidebook takes you through all the specifics of planning, promoting, budgeting, and running a sibling support group.) A good support group, whether it’s online or in person, will help assure siblings that they’re not alone in their feelings, experiences, and concerns. Plus it’s a great way to make new friends, which is always a plus for any kid! Provide access to accurate, age-appropriate information. Parents and teachers aren’t the only ones who benefit from accurate information about a child’s disability. Siblings, too, have an ever-evolving need for age-appropriate information about their brother or sister’s disability. Be proactive–seek out trusted sources of information, and provide siblings with the disability knowledge they need. Include information about treatments, health implications, terminology, social and behavioral considerations, and anything else that the sibling might find helpful in understanding their family member’s disability. Carve out one”“on”“one time with siblings. Siblings of kids with disabilities need to know that the adults in their lives care about them as individuals. If you’re a parent, carve time out of your hectic schedule to get some ice cream, go to a movie, or just window-shop at the mall with your child. If you’re a teacher, take time out for supportive, one-on-one talks with siblings of kids with disabilities. Let them know you’re there for them, that they’re important, and that you care about their interests and dreams. Celebrate every child’s achievements and milestones. The accomplishments of children with and without disabilities should be celebrated equally, both at home and in the classroom. That sounds like an easy principle to get on board with, but when one or more children in a family has intensive support needs, it can sometimes be hard to put into practice. Meyer & Vasady note that they’ve met siblings whose high-school graduations went unattended because their parents weren’t able to leave their brother or sister. Connecting families with respite resources and helping them brainstorm creative solutions can help ensure that the milestones of all family members are celebrated. Actively involve siblings in the educational team. Siblings often have lots of questions about their brother or sister’s school experience–and they’re also an invaluable source of information. Consider inviting (but not requiring) brothers and sisters to attend IEP meetings and transition planning meetings at school. Not only can they get their questions answered by educators and other members of the educational team, they can also offer unique insights and informed opinions that might make the planning process easier. Advocate for services that support siblings. Learn more about life as a sibling. Want deeper insight into siblings’ emotions, concerns, behaviors, and experiences? Learn more about life as a sibling of a child with disabilities by “listening to the experts.” Facilitate a Sibshop, host a sibling panel at your school or community center, and read books by and about brothers and sisters. Listening to the voices of siblings will help you understand where they’re coming from so you can provide more effective supports. Address siblings’ concerns about the future. Siblings should have a say in how involved they’ll be in the lives of their brothers and sisters with disabilities as they approach adulthood together, so don’t be afraid to have frank discussions. Be sure to include both male and female siblings in these discussions–sometimes, families lean on the caregiving support of sisters and neglect the role of brothers. Responsibilities among siblings should be shared whenever possible. Above all, keep in mind that self”“determination is for everyone–including brothers and sisters. Though they may play many different roles in the lives of people with disabilities, siblings have a right to their own life, too. Recognizing them as individuals and respecting their boundaries are two essential, overarching ways to support siblings as they prepare for the future, both as part of their family unit and as people with their own goals, hopes, and dreams. Learn how to organize workshops for siblings of children with disabilities with the popular Sibshop model, used in more than 200 communities in eight countries. You can read an excerpt and see the TOC here.